Dentures are tooth replacement prosthetics used to restore smiles following advanced tooth loss. A partial denture can be used to replace a number of missing teeth along an arch, and full dentures replace the entire row of teeth. 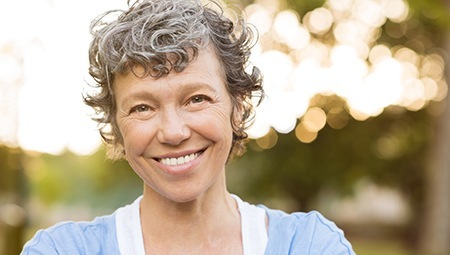 If you’ve lost numerous teeth or your complete smile, the Miller Dental Arts team would love to offer you natural looking dentures to restore your lost smile. 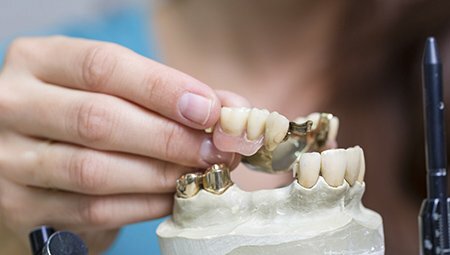 We custom craft dentures with complete care and precision in order to ensure every patient is comfortable and confident with their brand new smile. Both types of dentures use a gum colored base material to support all of the replacement teeth. The base of a partial is crafted to fit snuggly between remaining healthy teeth, and it is clasped into place using metal braces. A full denture relies on natural suction between the denture base and the gum tissue to anchor the prosthetic. In addition to these traditional, removable prosthetics, we also offer dental implant supported partial and full dentures that utilize the same high quality, natural looking dentures, but combine them with dental implant support for increased stability and longevity.